It's time to look at some unique hanging hardware solutions. I've already covered the basics on hanging picture frames and the many options you have on this page. Sometimes though, the basic hardware just won't cut it. If you want to hang something on brick, for example, there are easier ways to do it, that aren't permanent like drilling holes and using anchors. Maybe you have something that isn't in a frame at all, like a piece of glass or some type of free-form art work. There are solutions for that. Maybe you want to hang a wreath over a brick fireplace or on the brick in front of your house. Well, there are solutions for that, too. So, let's take a look at some of the challenges and the unique hanging hardware that is available to meet those challenges! Maybe your first instinct is to to avoid brick or maybe pull out a masonry drill bit. No need to do either. Brick Clips are a very simple to use, can be moved and removed whenever you want and come in different styles and finishes. They can hold a lot of weight, depending on which one you buy (always read the directions for suggested weight limit). Use Brick Clips to hang picture frames, mirrors, holiday decorations or just about anything else you can think of. They get great reviews for their simplicity and durability. No drilling or fastening required. Just clip in place an your ready to go! Now-a days there are many pieces of art made entirely of glass or other materials that are not displayed in a frame. 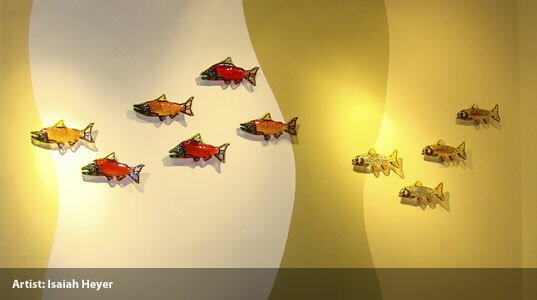 This creates a beautiful look, like the art is floating on the wall. This also creates questions about how to hang it. I found a very unique hanging hardware company that specializes in just this type of hardware. Hang Your Glass is a very creative company that specializes in free-form glass art work. I recommend you check out their web site to see all the different solutions they offer. Tell Poppi that you I sent you! No tools, no hardware, no studs. No studs. Just screw in wall and hang!